On January 1, 1987 the SwissChamp knocked off the Champion as the kingpin of the Swiss Army line. The SwissChamp has the most blades! The "more-bladed" knife, in addition to the blades of the Champion, also adds a screwdriver that threads into the corkscrew, a ball-point pen that goes under the handles in the manner of the tweezers and the toothpick, a sewing awl, a chisel, and a pair of large (for a knife) workable pliers. 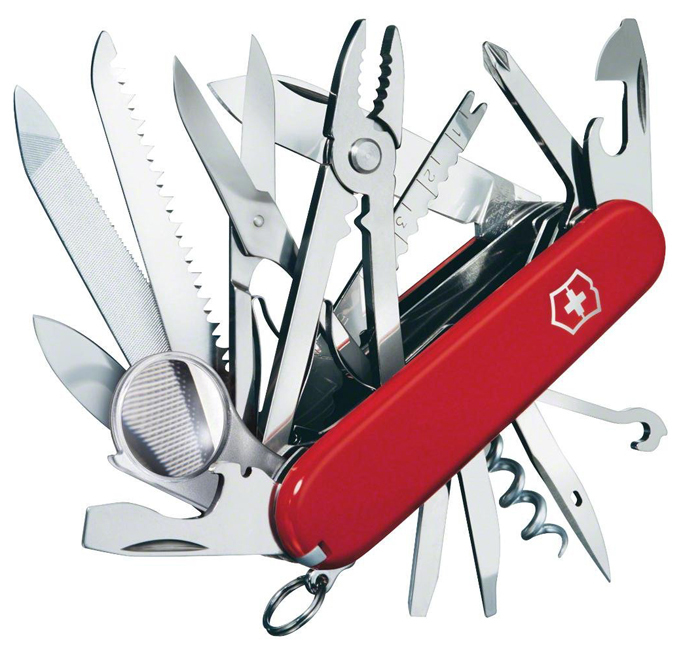 In total the SwissChamp has 29 functions in 15 blades. But the package doesn't stop there. This knife comes with a leather sheath containing an additional 11 items ranging from Band-Aids to a mechanical pencil. 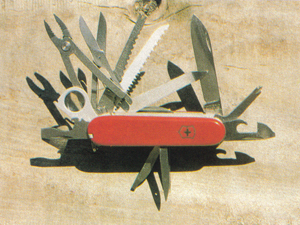 Adding more blades to a Swiss army knife is nothing new. It has been done since the first ones were made in 1897. But the question for this column is how do those 40 functions work. I'll give you the breakdown on the advance-of-issue SwissChamp we obtained thanks to Dan Delavan of Plaza Cutlery. The bigger than pocket-sized package necessitates the leather sheath, even though the aluminum liners and plastic handles do not add that much weight. The multitude of blades makes the knife 1" thick and weighs over a half-pound (11 ounces) with the sheath. In this case I feel Victorinox took a finely designed tool and added enough extra blades and doodads to make it awkward and bulky. The pliers add a lot of bulk, but during my testing I found little use for them. Anything that is stiff enough to require pliers usually requires stronger leverage than the fold-out variety can provided. ABOVE LEFT : File blade will saw through a coated nail. ABOVE RIGHT : The master blade is difficult to open without bumping your knuckle on the other blades. 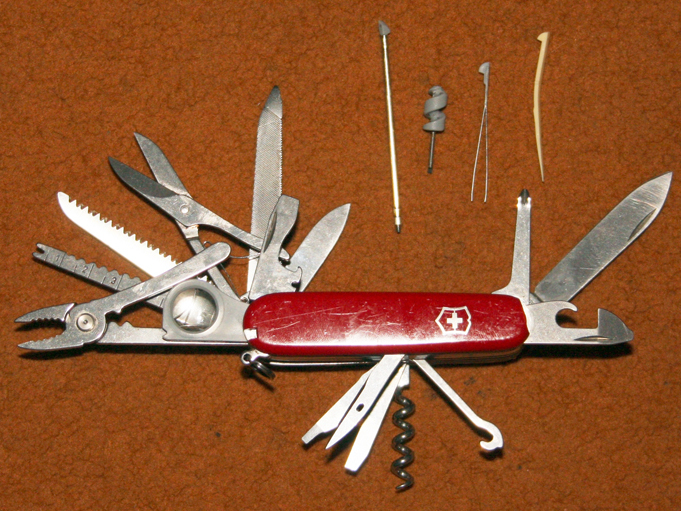 Yes, I know a Swiss Army knife is carried on the space shuttle and I realize there is one in the Museum of Modern Art, but those examples are not the SwissChamp. The thickness of the knife makes it difficult to open the master blade without butting the back of your thumb into the backs of the other blades. (A problem that would have easily been solved by putting the master blade nearer the mark side of the knife). The awl on the reverse side of the knife is nearly impossible to open with a fingernail (although you can put the thread-in screwdriver to good use in opening the blade). The ball point pen that fits under the handle stopped writing after I had carried the knife only three days. But there are some good things. If you get used to carrying the bulky lump around on your hip you will find yourself using it several times a day, and few cops are going to charge you for carrying a weapon if you have a Swiss Army knife. (On this model it might take the officer a long time to even find the knife blade on it.) Overall I did find it a well-made knife, with most of the blades opening smoothly and closing with good snap. The sawblade does saw, and the nail file, as illustrated in the brochure, did indeed file through a nail. The chisel blade was sharp and functional. On many knives with this many blades the natural assumption is that half of the blades are for show. Not so with the SwissChamp. It is a handy and functional tool. By the time you read this, the SwissChamp should be in stock at the usual supplier. It comes in red, white, or black handles.